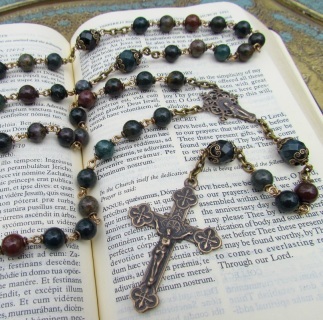 The rosaries on this page have already sold. The photos on this page are provided to assist customers with custom order ideas. 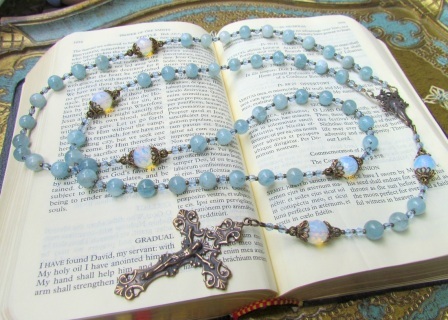 This handmade rosary is made with Sunset Blue Dumortierite Gemstones. The Aves are a large 8mm bead. The Crucifix is 2 1/2 tall solid Sterling Silver Glorious Crucifix. The Center is an openwork Center showing the Sacred Heart image. The bead caps are solid sterling silver Filigree. The rosary in this photo has sold. I have beads to recreate this rosary. Please allow 2-3 weeks for construction. 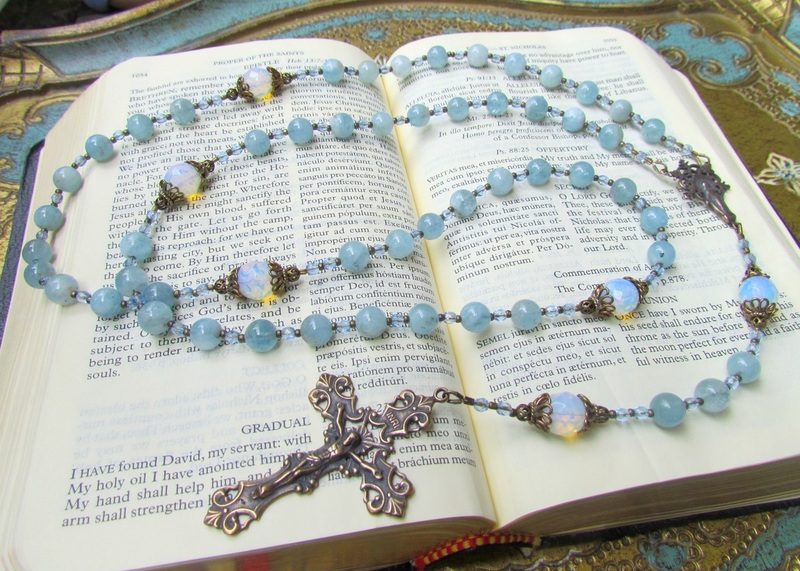 This custom rosary was handmade with faceted Sapphire Beads for the Hail Mary beads and the Our Father Beads. Crucifix and center are solid Sterling silver. Bead caps are solid sterling Silver Bali Bead caps. 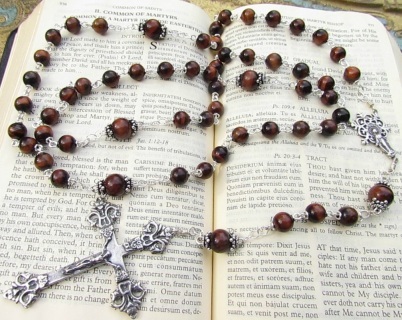 The rosary is made by hand turning Argentium 20 gauge wire around each bead. 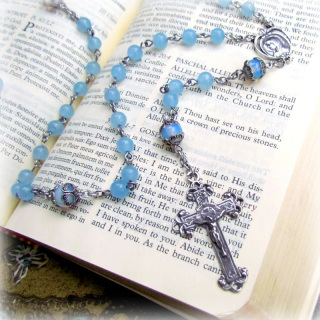 This solid construction guarantees this rosary can be treasured for generations. 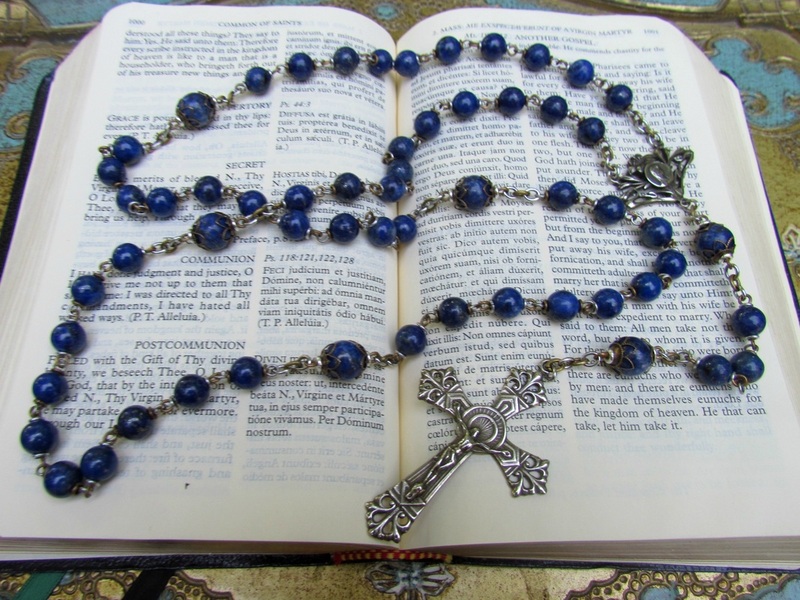 You too may order a similar Sapphire Heirloom rosary. The Sapphire beads come all the way from India, so you need to allow 3-4 weeks for construction. Contact me for a quote, the Silver prices are subject to the current market as are the Sapphire Gemstones. 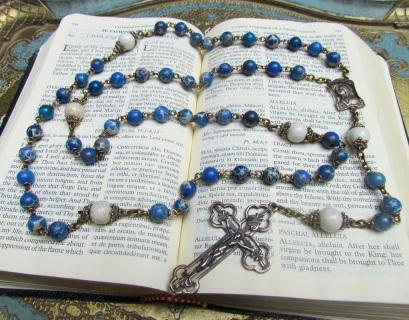 This heirloom rosary is made with 8mm Lapis Lazuli Gemstones and 10mm Garnet Pater beads. The crucifix and center are anitque reproductions hand cast in solid sterling silver in the USA. The beads are hand wired using 20 gauge Argentium Silver wire. The Sterling silver chain has soldered links for added strength and durability. 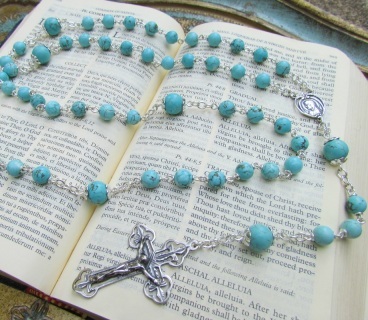 Custom Rosary made with white bronze and Stainless steel wire and chain. Gorgeous Lapis Lazuli gemstones in 8mm and 10mm size. A stunning heirloom rosary crafted with sterling silver wire and findings. Large 8mm Turquoise Gemstones were used for the Hail Mary beads. 10mm Turquoise Our Father beads. The crucifix and center are solid Sterling silver, hand cast in the USA from antique pieces. Custom order sold. ($244.00) More beads available allow 2 weeks for completion. Labradorite is a gorgeous stone with flashes of blue light from within. This rosary is made with large 8mm Labradorite gemstones for the Hail Mary beads, and 10mm Our Father beads. The sterling silver wire is hand turned on each bead. The chain is sterling, soldered and sturdy. The Pardon Crucifix and center are solid sterling silver hand cast from antique pieces. Allow 2 weeks for custom order. This rosary is a custom piece for Jeffrey. 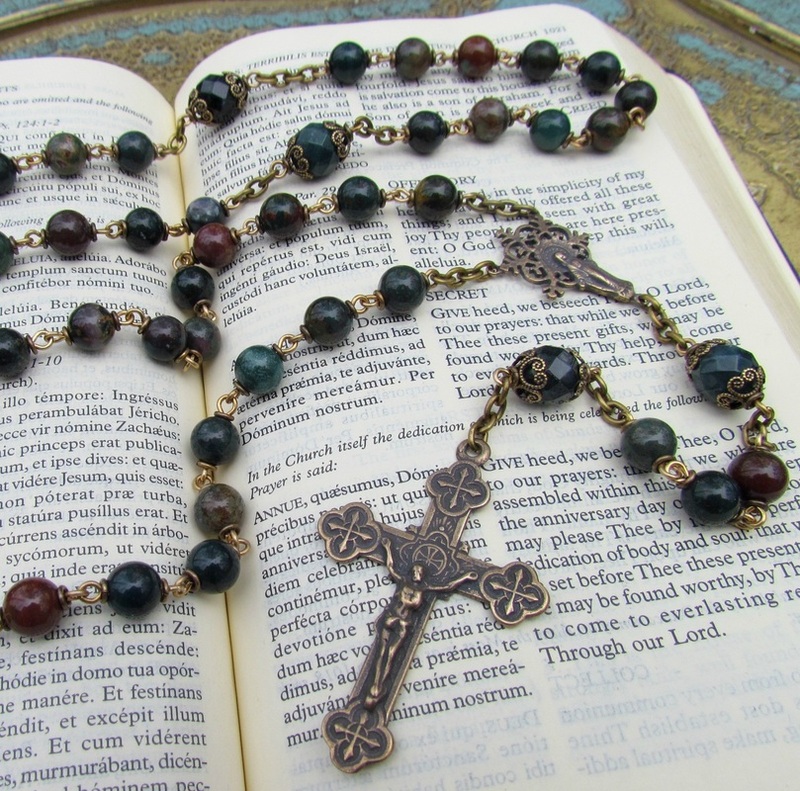 An exquisite heirloom rosary made with large 8mm Red Tigereye gemstones, and 10mm Tigereye Our Father beads. The wire, chain, bead cap are solid sterling. The esquisitely detailed Victorian Crucifix is stunning with the Our Lady of the Snows centerpiece. 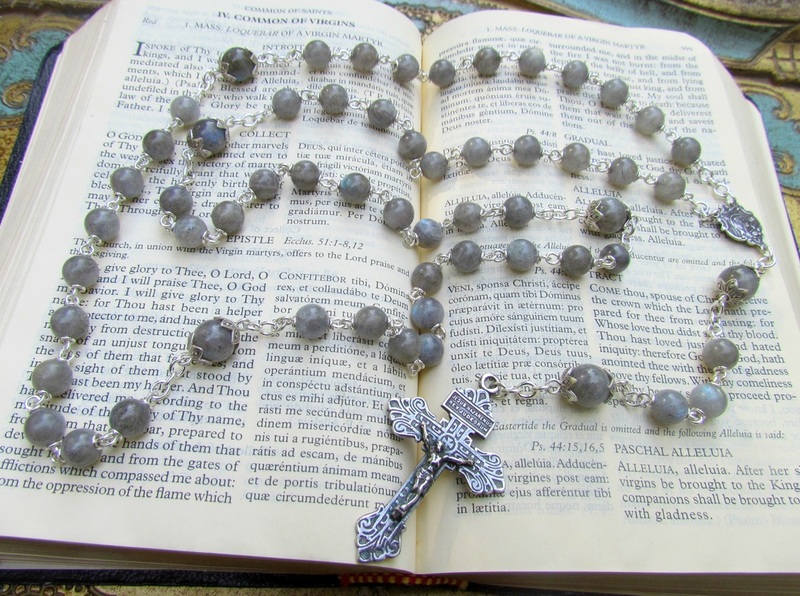 These rosary parts were hand cast in solid Sterling Silver from original antique pieces. 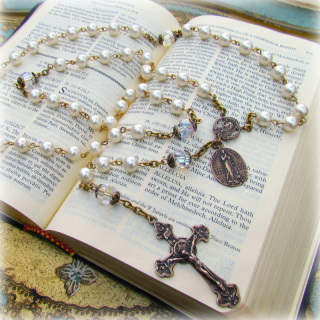 This large heirloom rosary is a show stopper and will be a favorite for years to come.